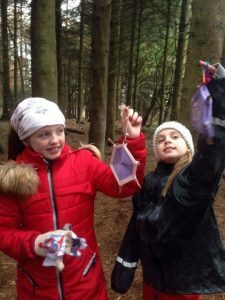 At Forest School children get to take part in activities that encourage creativity and exploration. All of our activities are fun and interesting, and importantly something they would probably never otherwise experience. We run our Forest School programs over a minimum of 6 sessions. The lessons are designed to offer a continuum of learning, over which the children gradually build up their skills and confidence of working and playing in the natural environment. We progress towards activities involving tool use and fire at a rate suitable to the individual group. All of the activities we do during Forest School are designed to challenge children – but also to be achievable. This way children are able to stretch their skills whilst also building their confidence. Our Community Woodland Engagement Officer has designed our Forest School program to meet your needs and they will be tailored to meet specific curriculum links. 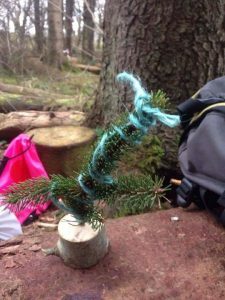 We provide all of the lesson plans for Forest School and are able to provide them to schools in advance for their opinions and approval. Each session has a lesson plan, with set learning objectives and child-initiated learning is always encouraged.